Has it always been your dream to live on the East Coast? Maybe a new job opportunity presents the perfect chance to pack up your bags and venture to one of the many cities closer to the Atlantic. Have you ever considered Charlotte, North Carolina? 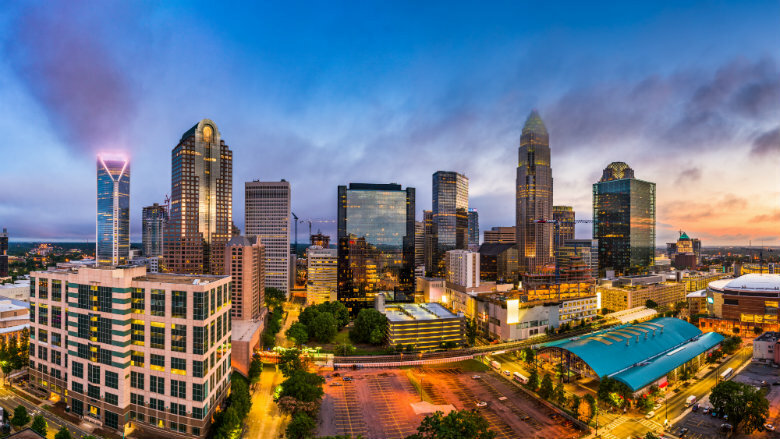 Charlotte is one of the largest cities on the East Coast, but it is not just its size that attracts thousands of people to the area every year. Although Charlotte is not the capital of North Carolina, you would think that it could be because of its size. The city has been ranked one of the best places to live in the nation because of its mix of big-city life and southern charm. Charlotte also happens to be situated in the perfect location, where you can visit both the mountains and the beach with just a short drive. You will find many housing, dining, and entertainment options in the area that won’t break the bank. If you are looking to move to the Charlotte area, we can assist you by offering hassle-free car shipping services. At National Dispatch, we pride ourselves in transporting our customer’s cars in the safest and fastest manner possible. Learn more about North Carolina Car Shipping. Car shipping provides the easiest and safest way to get your car to your new home. Before traveling to Charlotte, there are a few things that you might want to keep in mind. Book ahead of time. To ensure that you get the services you are looking for when you need them, it is very important to book auto transport as soon as possible. This allows the car transport company ample time to get everything in order and to secure a spot for the vehicle on the carrier. Select services with budget and needs in mind. National Dispatch cannot be a top-rated company without having competitive rates and offering a wide range of services. When booking car shipping services, keep in mind what type of carrier you want and when you need your car delivered by. Request a quote. One question probably on your mind is “How much does it cost?”. This question can be easily answered with the click of a button. National Dispatch offers a free, instant car shipping quote using our online quote calculator. Unlike many of our competitors, our quote requires absolutely no personal information. There are nearly two million people living in the metropolitan area of Charlotte. The city draws many visitors every year with its sports teams and other entertainment options. Furthermore, the area makes a great place to live, work, and study. Here is what you should know about Charlotte. How Do Folks Get Around? There are many ways to get around the city, including by bus and train. However, the most popular method of transportation is by car. This is likely due to the city’s great size, and because the city lacks a public transportation city that spans the entire area. It is good to note that the average commute time is less than half an hour. This means that traffic is not a problem of much concern. If you need to travel outside of Charlotte, the local airport features both national and international flights. Overall, Charlotte is known for having pleasant weather. During the summer, you can expect warm, sunny weather. Be aware that the peak of summer can be a scorcher with temperatures reaching into the 90s. Like much of the South, you can expect mild winters. Snow is not very common, with only a few inches falling every year. If you love the snow, don’t let this get you down. With many ski resorts a short distance away, you have plenty of opportunities to enjoy the frozen stuff and hit the slopes. Charlotte is much more affordable than other cities similar in size. Over the years, the cost of a home, in the area, has gone up in price. However, housing costs are still below the national average. Charlotte is full of so many things to do and see. It is home to popular museums, shops, restaurants, and recreational centers. Therefore, art enthusiasts, foodies, nature lovers, and more can all find something they enjoy. Here is a list of some of the most popular attractions in the area. U.S. National Whitewater Center – This is the world’s largest man-made whitewater river. You can choose from a variety of activities including kayaking, paddle boarding, and whitewater rafting. Mint Museum Uptown – This is a museum is dedicated to American and European art. The museum even has collections on fashion, modern and contemporary pieces, and Native American art. 7th Street Public Market – If you are looking for something free to do, go walk around the market place. Here, you will find a variety of local produce, wine, and other goods. Charlotte Motor Speedway – Just northeast of Charlotte, you will find Concord and the Motor Speedway. If NASCAR is your favorite pastime, then grab your tickets to watch a race. Carolina Raptor Center – A trip to Charlotte wouldn’t be complete without visiting the Raptor Center. The center operates as a rehabilitation center for these injured, sick, or orphaned birds. National Dispatch is a leading provider of auto transport services. We ship cars, trucks, vans, SUVs, and motorcycles anywhere in the United States. If you are in the market for a reliable and trustworthy car shipping company, the search is over. Request a free, instant car shipping quote using our online quote form. No personal information is required to get a quote in seconds. Only four simple fields of information is needed: vehicle make, vehicle model, pickup location, and delivery location. If you prefer to speak with an auto transport representative, call us at 800-321-2051. We also have an online chat feature on our website. Get all your questions answered today!